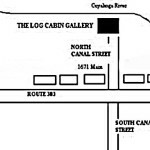 The Log Cabin Gallery is tucked behind our private residence at 1671 Main Street (State Route 303). You cannot see the cabin from Route 303. To get to the Cabin, turn north up North Canal Street. This little road is easy to miss. If you are traveling east on 303, slow down as you pass Yellow Creek Trading Co. If you are traveling west on 303, slow down as you cross the bridge over the river. Turn right after you pass, River Light Gallery. Look for the sandwich-board type sign and our open flag at the bottom of the road at North Canal and Main Street when the Cabin is open. 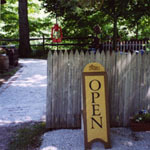 The Log Cabin Gallery is located on private property in the backyard of our home. Thank you for respecting our privacy when the Cabin is closed. Please visit us during our open exhibit dates in 2016.